If selected to attend, you will receive an email with venue details. 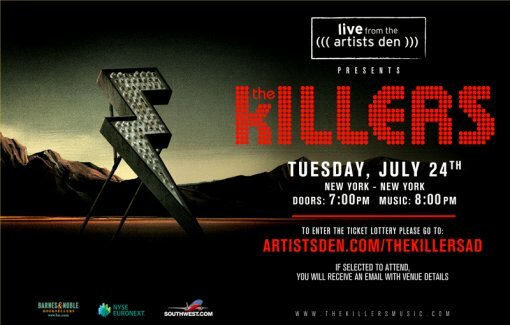 The Killers are also apparently playing a show at the intimate-ish Webster Hall on Jul 23. Tickets for that show go on presale on Wed, Jul 18 (allegedly). Stream the new single “Runaways” and view more The Killers tour dates after the jump. UPDATE 2: It looks like The Killers show is in the main room, Grouplove is playing a free Sirius Satellite Radio concert that night in The Studio. UPDATE 1: I’m trying to find out if this is The Studio or the main room.